Surrounded by the hustle and bustle of downtown Chicago, the Hotel Allegro Chicago sits in the heart of the city's busy theatre and business districts, inviting local and out-of-town guests alike to be the star of their own Chicago experiences. Our lively interior design and outstanding amenities combine with gracious service, making for a unique hotel experience. Featuring vibrant décor that blends Art Deco design with a chorus of modern colors to create memorable Chicago accommodations, this Kimpton Hotel with four star services has an infectious energy. Located in the North Loop near the Magnificent Mile, this luxury hotel in downtown Chicago, Illinois makes you the star. 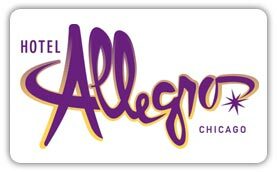 "Allegro" is an Italian musical expression meaning "bright and lively," and the Hotel Allegro lives up to its name.